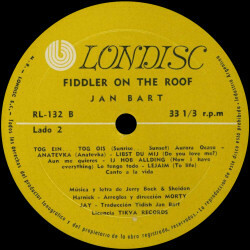 Jan Bart was born at January 26, 1919 in Sambor, Poland and studied music at Warsaw Academy of Music and Berlin Conservatory. He came to America as an immigrant boy in 1930. Became a cantor at the age of twelve and started touring the theatrical circuit five years later. During these years he also collaborated with Major Edward BowesвЂ™s Amateur Hour. 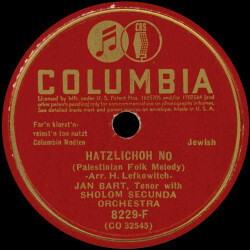 He married in 1941, and also acquired his own radio program the same year which lasted more than fifteen years, first on "Yiddish Swing" and then "The American-Jewish Caravan of Stars" over WMGM station. He also enjoyed tremendous success on his own television show, "The Jan Bart Show" over WATV in New-York. His own radio show by the same name was has been sponsored for more than six years and is on daily over WEVD. His various night club appearances included the Last Frontier in Las Vegas, the Latin Quarter in Miami Beach, the Blue Room of the Roosevelt Hotel in New Orleans. He has also made many television appearances with Milton Berle, Mike Wallace, This is Show Business and other programs. He also toured in United States, Canada, Europe, Australia and Israel. 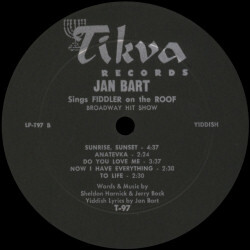 Jan Bart was a product of the вЂњBorscht BeltвЂќ, the summer resort area in New York State that has produced such stars as Danny Kaye, Miltor Berle and Jacjie Gleason. Perhaps his greatest thrill was singing to an audience at BrooklynвЂ™s Ebberts Fields which included the late President Roosevelt, who commended Bart for his performance. 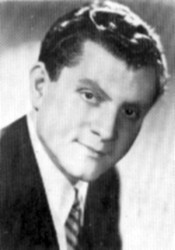 In 1964 Jan Bart became a member of ASCAP. He died in 1971 in New York.